FREE TERRITORY FOR A FREE PEOPLE. 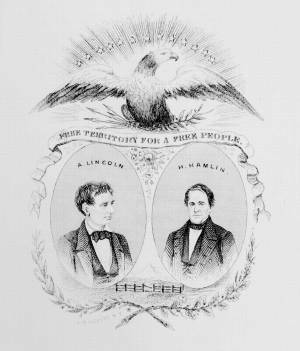 A proof, printed on paper, for a small campaign badge or banner for 1860 Republican candidates Abraham Lincoln and Hannibal Hamlin. The badge has interesting similarities to "Lincoln and Hamlin" (no. 1860-10), featuring oval bust portraits of the two candidates surmounted by an eagle emanating rays of light and stars. Here the eagle spreads its wings and clutches arrows and an olive branch in his talons. Below the eagle is an olive branch. Directly above the portraits is a streamer with the motto: "Free Territory for a Free People." Between the portraits is a landscape with a rail fence with a break in the center. Below, an olive and an oak branch join.